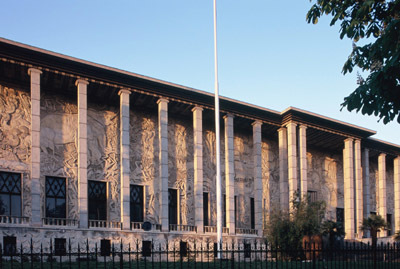 Now called the National Museum of African and Oceanian Arts, a permanent museum, it is the only monument - with the Zoo of Vincennes that was intended to survive the ‘Colonial Exhibition’ of 1931. Janniot was selected to carry out this immense stone tapestry, helped by Forestier, Barberis and thirty other practitioners. Behind the thirty-two tall and slender columns, they are fourteen metres high, appears the immense mural carved by Janniot around the allegorical figure of Abundance and of the large harbours and airports of France and Africa. Madagascar and the Antilles on the left, Asia and Oceania on the right presenting to France their natural wealth. The treatment of the figures refers back to Ancient Egyptian sculptures and to Mahabalipuram in India.